Professional Cross Cut 40 L Shredder for small office use with continuous duty motor - THROW & SHRED system for shredding crumpled paper . 3.5x40mm Cross Cut / DIN Security Level P-4 for sensitive, confidential & personal data. More Info. The KOBRA +3 CC4 is a cross-cut shredder with a transparent opening lid that shreds up to 14 sheets at a time by just inserting them into the throat at the front. You can shred CDs, DVDs and credit cards by inserting them into a separate entry throat. The +3 CC4 also features a unique opening lid that also allows you to shred crumpled paper. This model features continuous duty shredding with a 24 hour continuous duty motor meaning no duty cycle or cool down periods. 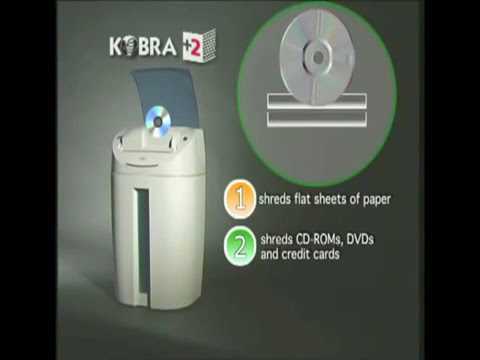 The KOBRA +3 CC4 Shredder features two separate sets of cutting blades, one for shredding paper and the second for CDs, DVDs and credit cards. The waste falls into two separate integrated removable bins which keep shredded paper and plastic separate. Equipped with and Energy Smart system with optical illuminated indicators for zero power consumption in stand-by mode and environmental protection. The +3 CC4 features a 24 hour continuous duty operation motor and is also 100% jam proof. All Kobra shredders now also feature a lifetime warranty on the metal drive chain and feature an internal readable diagnosis system which records operating hours, number of jams and machine use. The use of a P-4 shredder such as the +3 CC4 will aid your GDPR compliance. A safety system equipped with dual electronic sensors that automatically cut off the machine when the lid is lifted up. This technology allows you to put crumpled paper into the machine for it to be shredded.